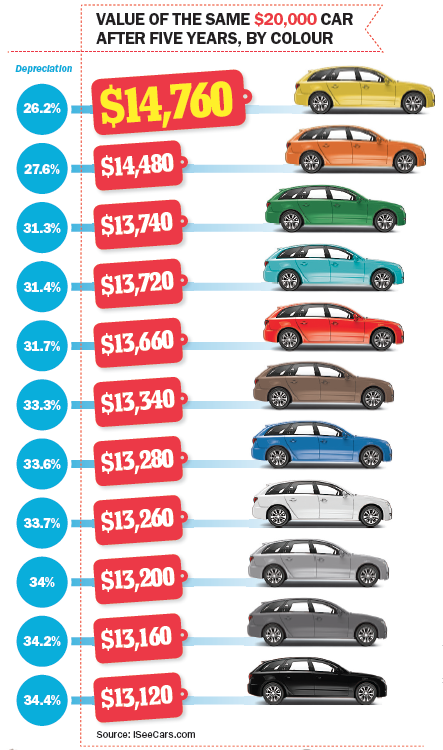 Surprisingly, any vehicle in a sunshine hue nets top resale dollar, according to a 19-year U.S. study analyzing over 20 million used cars of all different colours and makes. The reason? Scarcity. Popular colours like black and silver dominate listings, but only 1.1% of all cars come in yellow or orange. Below we show how the same $20,000 car keeps $1,600 more of its value after five years when it’s painted yellow and not black.